The DHCP Client Table contains information about the devices connected to the router either wired or wirelessly. It displays the name of the device, the interface it is connected to, the duration until the connection expires, and the assigned IP and MAC addresses. QUICK TIP: Devices NOT connected to the network wired or wireless will not be detected by the DHCP Client Table. To check the devices connected to your router using the DHCP Client Table, click here. Access your Linksys cloud account. Launch a web browser and enter your router’s IP Address or "myrouter.local" in the Address bar then press [Enter]. QUICK TIP: The router’s default IP address is 192.168.1.1. If it doesn’t work or if the IP Address has been changed, check your Linksys router's IP address. For instructions, click here. To remotely access your Linksys cloud account, enter https://www.linksyssmartwifi.com on your web browser instead of the router’s IP address. Enter your Email Address and Password, and then click Log in. NOTE: If you still haven’t created, activated or associated an account to your router, click here for instructions. For local access of your Linksys cloud account (router is not connected to the Internet), enter your Router Password instead of your login details. For more information, click here. 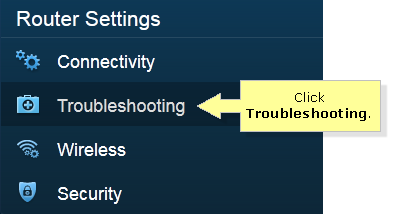 Once the Linksys cloud account home page appears, click the Troubleshooting Tool on the left navigation pane under Router Settings. Under the Status tab on the Troubleshooting Tool page, click the button located on the lower-right corner of the page. The DHCP Client Table will appear showing a list of devices with the corresponding IP and MAC addresses.